Get the most accurate Psychic Advice! Try it! Your first question is free! We only partner with the most gifted psychics to provide you with the most insightful readings from our authenticated psychics. Completely confidential, ask about love, money, career, or what your destiny has in store for you. Get the latest and most accurate horoscopes so you can prepare for what is coming in the future. Getting the answers you need has never been easier. Simply choose your psychic, ask your question, and get your answer! At PsychicTxt, we are committed to providing you with real insight when you need it most. Whether you are inquiring about love, career, finances, or even general life concerns, our psychic advisors are here to provide you with answers you can trust. All of our online psychics have been tested for authenticity and offer a wide range of specialties – from tarot readings to clairvoyance to relationship matters; our psychics can do it all! Want to find out what to expect in week ahead? We also offer free weekly astrology based horoscopes. Find out if new love is about to enter your life, see if your job concerns are going to be resolved quickly, or obtain other invaluable information about your life. What are you waiting for? 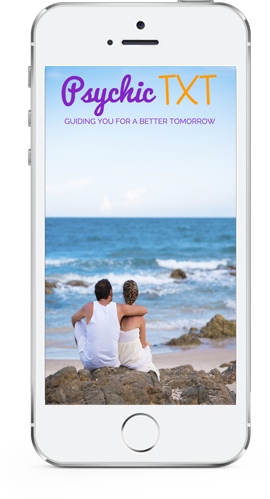 Download the PsychicTxt app today and get started. Your clarity is waiting for you. PsychicTxt is currently available on both Android and iOS devices. Click the link on the bottom of this site to download it right away! Simply select the “Psychics” tab, choose your psychic advisor, and send your question. It’s as easy as sending a text! Can I Review My Past Readings? Yes you can! PsychicTxt stores all of your conversation history. Simply choose the “InBox” tab to view your past psychic readings. How Do I Purchase More Credits? Getting the credits you need is easy. Simply open the menu, choose the settings option, and select your preferred credits package.